(a) A spreadsheet widget allowing the user to edit a CIF loop. In this example, the user is changing the H atom of a hydrogen bond. Entries flagged for publication show up in the editing widget on a coloured background. Hydrogen-bond data should always be archived using the dictionary-defined data items, even if the data are not to appear in the published report. The widget recognizes these items and provides drop-down lists of permitted values (as read from the dictionary or taken from related data in the CIF, e.g. atom labels, symmetry codes). (b) A similar widget, but allowing non-standard tables to be prepared and stored in the CIF. In this case the data items are arbitrary inasmuch as their definition provides no information about the data value (thus excluding the use of the data for anything but publication purposes). In the example shown, the user is preparing a hydrogen-bond comparison table. The data shown have been imported by copying a table of hydrogen bonds from a web page describing a related structure and then clicking the `Import data' button; publCIF has converted the copied data to CIF format and populated the table cells. 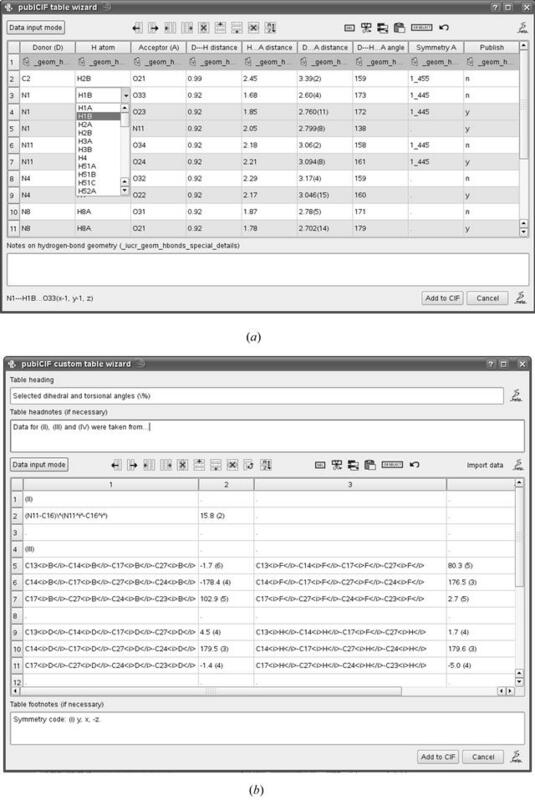 The next step might be to copy tabulated data from the current preprint and import it, then use the widget's table manipulation tools to rearrange the rows/columns/cells. This widget provides fields for adding a table heading, headnotes and footnotes.